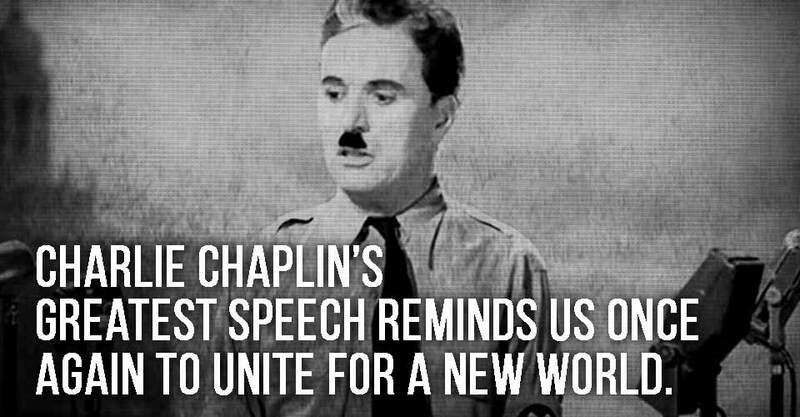 Charlie Chaplin's greatest speech reminds us once again to unite for a new world. People all around the globe are reeling from the horror of the recent terrorist attacks in Paris and Beirut, as well as the downing of airlines, the atrocious attacks and abuses of power in Palestine and Middle East, Eastern Europe, Syria, Africa, India and the USA. Not forgetting the countless atrocities happening on every continent across the world not listed here, none of the loss or suffering is justifiable yet it seems to have become the current way of the world and part of our every day lives. When people are dying and suffering at the hands of each other, it is quite simply against the law of nature and love. And for what? For the purpose of greed? Because of jealousy? In the name of money? Of ego, powerand religion? Quite simply as I sit typing, in my most weakest of moments, I fear the human race is doomed. Every day on the news and social media platforms the stories are reported and repeated, and as a result, fear, grief and anger rise from the observers and hopelessness overwhelms us. ‘To those who can hear me, I say – do not despair. The misery that is now upon us is but the passing of greed – the bitterness of men who fear the way of human progress. The hate of men will pass, and dictators die, and the power they took from the people will return to the people. And so long as men die, liberty will never perish……You, the people, have the power to make this life free and beautiful, to make this life a wonderful adventure…..Then – in the name of democracy – let us use that power – let us all unite. Let us fight for a new world’. I wanted to bring this speech to your attention at this time to inspire us, so that we can ‘re-member’ our humanity and above all to unite and remind us not to give up hope. Please watch and share this amazing clip of Charlie Chaplin’s speech from ‘The Great Dictator’, and.. Champagne is the official bubbly brain function booster.